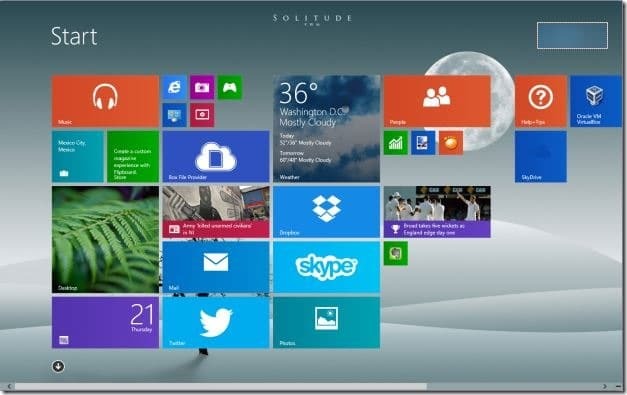 The Start screen, first introduced with Windows 8 has been enhanced with Windows 8.1 update. The Start menu replacement now supports more tile sizes, lets you uninstall multiple apps at once, and also allows you set desktop background picture as Start screen background image. By now, everyone who cares would know that Windows 8 didn’t let users set a custom picture as Start screen background image. While Windows 8.1 users can set a custom picture as Start screen background image by configuring Windows 8.1 to use desktop wallpaper as Start screen background image, the downside is that the moment you change the desktop background, Windows automatically updates the Start screen background. 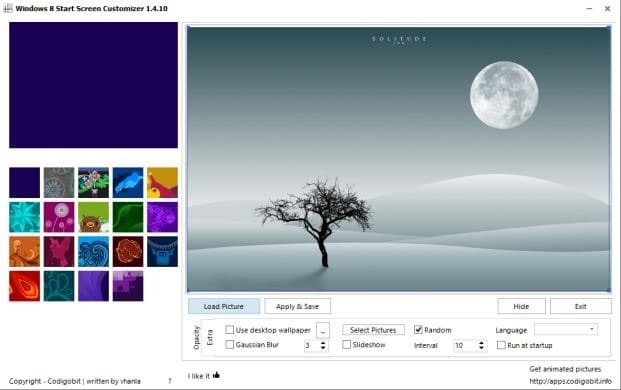 Users who would like set a custom picture as Start screen background image without using the desktop background picture have no option but to use third-party tools. As you probably know that, the Stardock Corporation’s Decor8 also lets you change the Start screen background and color, but then it’s a paid software. Luckily, there is a free software out there to change the Start screen background in Windows 8 and Windows 8.1. Start Screen Customizer is an excellent piece of software designed to help you set your own picture as Start screen background image in Windows 8 and Windows 8.1. The Start Screen Customizer software, which was released back in 2012 when Windows 8 RTM was released, has recently been updated and it‘s now fully compatible with the latest Windows 8.1 RTM build as well. The newest version of Start Screen Customizer not only enables you set a custom picture as Start screen background but also capable of rotating the background with the images of your choice at regular intervals. The ability to set an animated picture as Start screen background is probably the best feature of this free software. You can set an animated image file with GIF extension to have animated Start screen background. Besides, it offers settings to change the Start screen and tile opacity as well. Changing Start screen background is extremely easy with this utility. Run the software, first click on the first tile (solid color tile ) in the left-pane of the application to set a solid picture without any patterns as Start screen background image (if you set a custom picture when there is a pattern picture as background, the pattern will appear on the new background). Then, click on the Load Picture button to browse to the picture file that you would like to have as the background. Finally, click Apply and save button to have the new picture as background image. And if you would like configure Start Screen Customizer to automatically change the background picture, run the application, click Select Pictures button, browse to the folder containing multiple images, select the pictures that you would like to see as Start screen background and then click the Save button. Lastly, change the time interval and then check the option titled Slideshow to activate the slideshow feature. 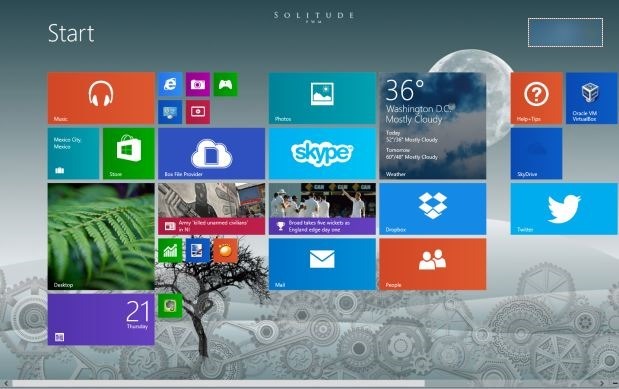 Overall, it’s a fantastic and must have tool if you love to have a personalized Start screen. Start Screen Customizer is fully compatible with 32-bit and 64-bit Windows 8 and Windows 8.1. NOTE: As with the case of 8oot Logo Changer (boot screen logo changing tool), the file that you download from developer’s page offers you install an application called Okitspace. When you launch Windows 8 Start Screen Customizer setup file, uncheck the option titled Accept software updater and Okitspace option, click Next, and then click Cancel button when you see a dialog box to begin downloading the actual setup file of Start Screen Customizer. Once you have the actual setup file, run it, and then follow straight-forward instructions to install the same. The link published here refers to the wrong website.